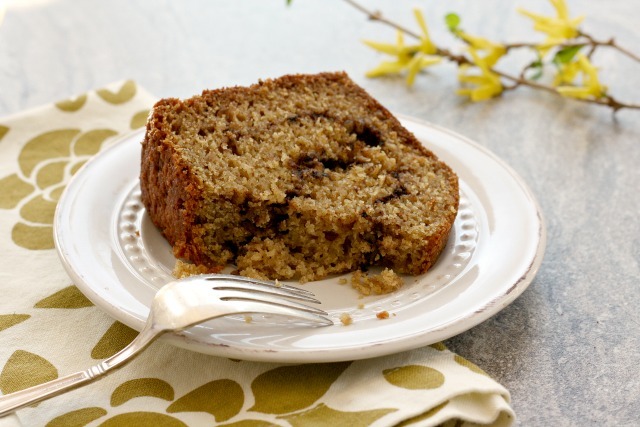 A richly flavoured sour cream coffee cake made with stoneground flour. I don’t recall Easter egg hunts when I was really little but I do recall adventurous hunts out in the yard during my high school and university years. It was more of a race and wrestle than a hunt since dad would simply toss the eggs around the yard as we ran around after him. Still, I love how the idea of hiding and hunting is irresistible to kids. Years ago my husband would occasionally find my son’s little Thomas the Train in his acoustic guitar. Quincy managed to wedge it through the strings and into the centre hole, a perfect hiding spot. And there was the time I discovered my nephew “feeding” my new CD player strips of paper, amazed at how they disappeared when he pressed the open/close button. If you have family activities planned for the holiday weekend this is the perfect recipe to go with it. This cardamom coffee cake has been a family favourite since mom fist discovered it back in the 1980s. 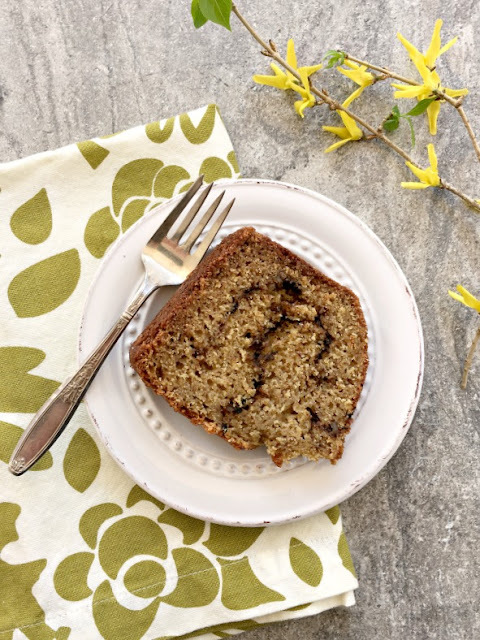 Don’t be fooled by the name – this is no morning snacking cake. It’s rich and delicious and feeds a crowd. The recipe is from our family favourite Moosewood Cookbook. Preheat oven to 350 F. Butter and flour a 10” tube or bundt pan. In a large bowl beat the butter and sugar until fluffy. Add eggs, one at a time, beating well after each addition. Stir in the vanilla. In another bowl sift the flour, baking powder, baking soda, salt and cardamom. In a small bowl combine the nut mixture ingredients. Spoon 1/3 of the batter into the prepared pan. Sprinkle with half of the nut mixture then add another third of the batter. Cover with remaining nut mixture then top with remaining batter and spread lightly to smooth the top. Bake for about 75 minutes or until a tester comes out clean. Let cool in the pan 20 minutes, run a butter knife around the edge to loosen and then invert on a plate.